Before I write another word, I want to make it clear that this is NOT a commercial. At the heart of this blog post is the belief in a brand, as well as the person behind it. 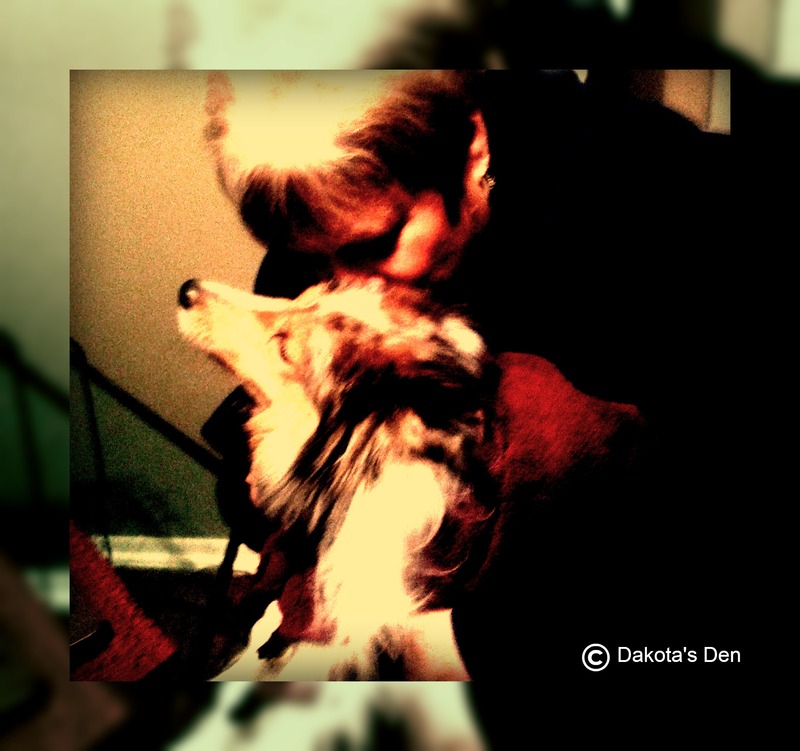 Long before I had Dakota’s blog, he was eating Nutrish®. Why? Because I have been a fan of Rachael Ray’s from the time her first 30 Minute Meal shows aired on The Food Network. In those first shows she wasn’t the star that she is today. She was, by her own admission, a “home cook” NOT a chef. Her first shows were a tad awkward, she seemed tentative and reserved, a far cry from the bubbly, talk show host, magazine magnate and household word in the kitchen that she is today. What I saw in her then, and what I see and relate to now, was that she was and is REAL. She seems approachable, she drops food “it isn’t a party until the food falls on the floor” and she burns toast. Yes, she burns toast. Just like you and me. I knew that she used to test recipes on her first dog, a pit bull named Boo, in her cozy cabin kitchen in the Adirondacks. She COOKED for her first dog, she cooks for her current dog, Isaboo, she cooks for her family. She is a home cook, like ME and like many of YOU. I own the majority of her cookbooks, I subscribe to her magazine, I watched nearly every episode of every show she has been on, beginning with The Food Network and beyond. 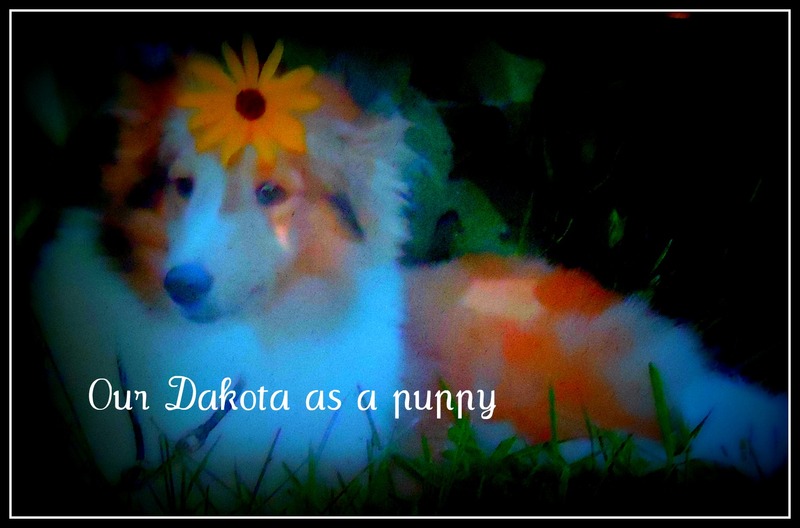 Dakota became a part of our family in 2007, Rachael Ray began her dog food company, Nutrish®, in 2008. 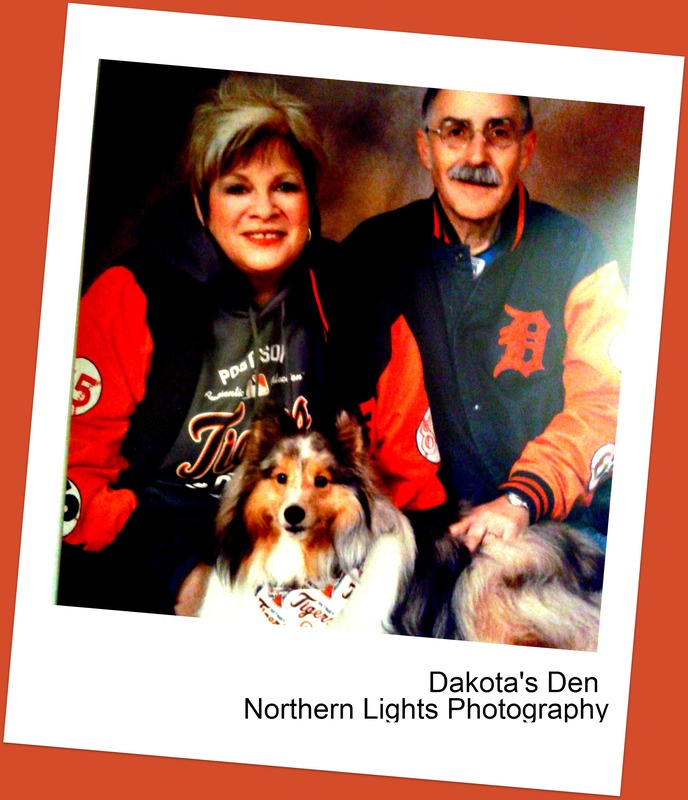 As soon as Nutrish® was available in Michigan, it was served to Dakota. He has eaten it ever since, long before his blog began in 2011. It is the ONLY dog food that he is served. Did you know that sales of Nutrish® goes towards Rachael’s Rescue? 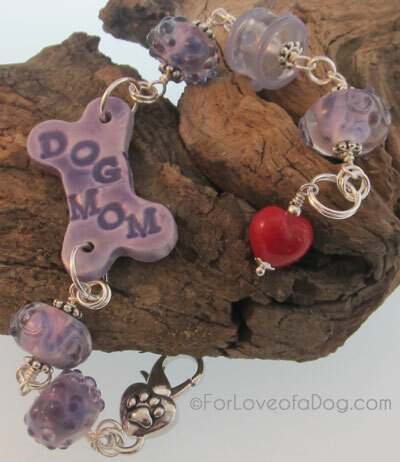 Rachael’s Rescue was created for “forgotten pets”, for those that have no one to love them. There is nothing, and I mean NOTHING better than being given the opportunity of representing a brand that you LEGITIMATELY USE, that you LEGITIMATELY BUY, you BELIEVE IN THE BRAND, AS WELL AS THEIR PRODUCTS. Yes! I AM yelling! I will shout it from the rooftops! Writing blog posts about a brand and products that you love are not a chore, you aren’t nervous about what you are going to say, or what the brand will think, why? Because you legitimately LOVE THE PRODUCT. When you love and believe in a product, the rest is gravy, whatever you have to say will come naturally, it comes from the heart, it comes from actually being a regular consumer of the product. 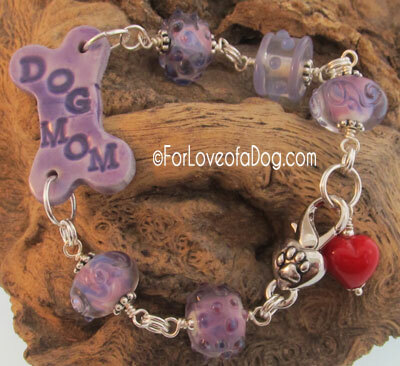 BlogPaws is another love that I first discovered in the fall of 2009. 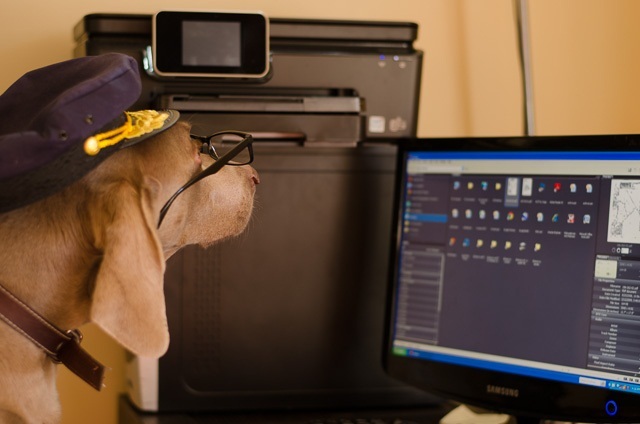 Without BlogPaws I wouldn’t know a thing about blogging. 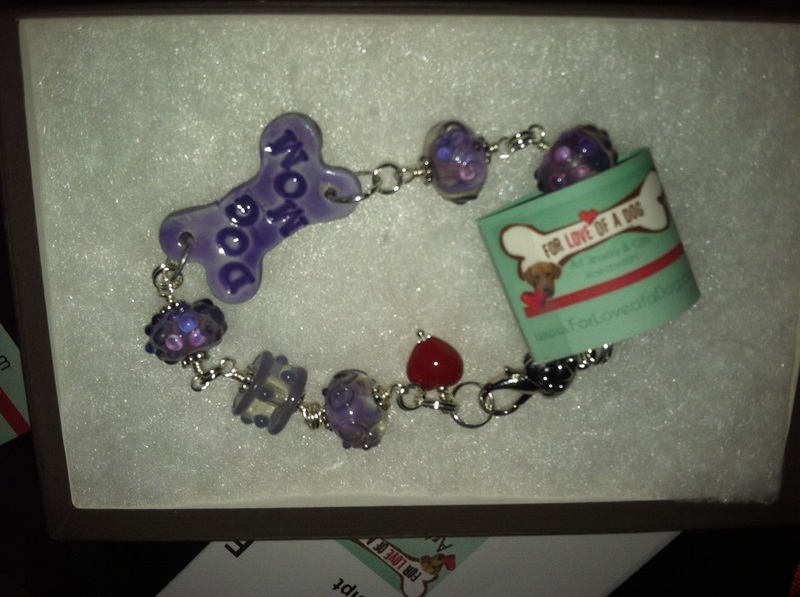 When I first discovered BlogPaws it was to me, a gift from the Gods! Imagine my excitement when a brand that I LOVE approached me to be a “brand influencer”, and offered to sponsor my trip to BlogPaws 2013. I felt as if I had come full circle. I was ecstatic. It was a dream come true. I jumped on that opportunity the way Dakota jumps on his Rachael Ray Nutrish soup bones. 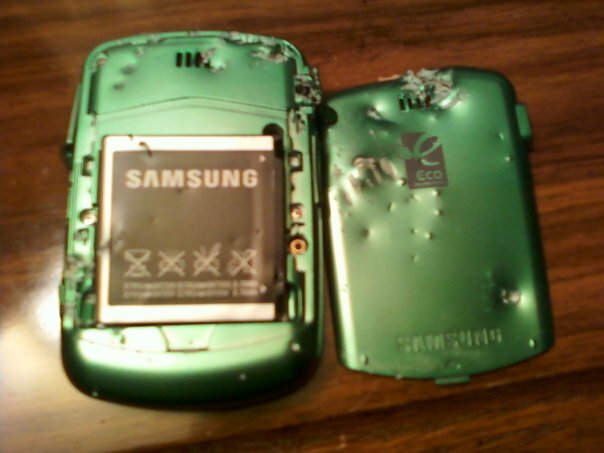 If I had a tail it would have wagged. 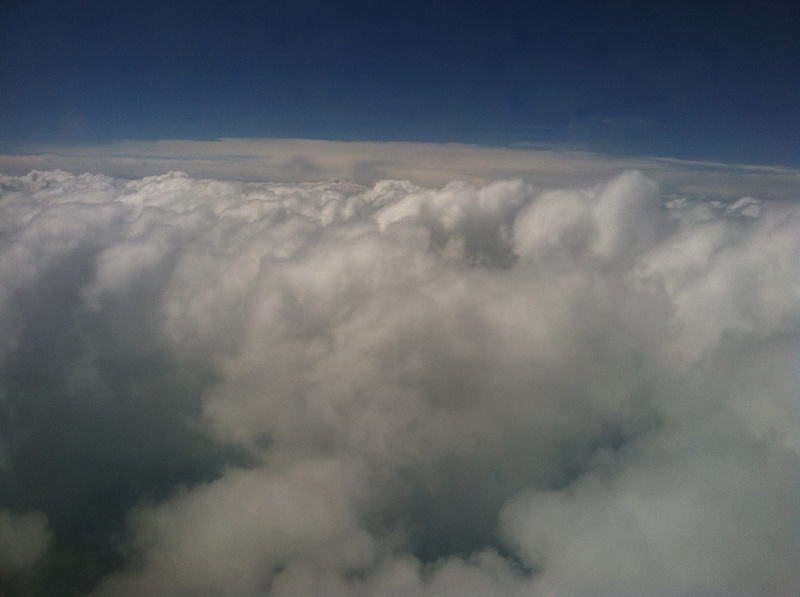 I wasn’t just on an airplane flying to BlogPaws, I was floating on air! I took this from the plane! 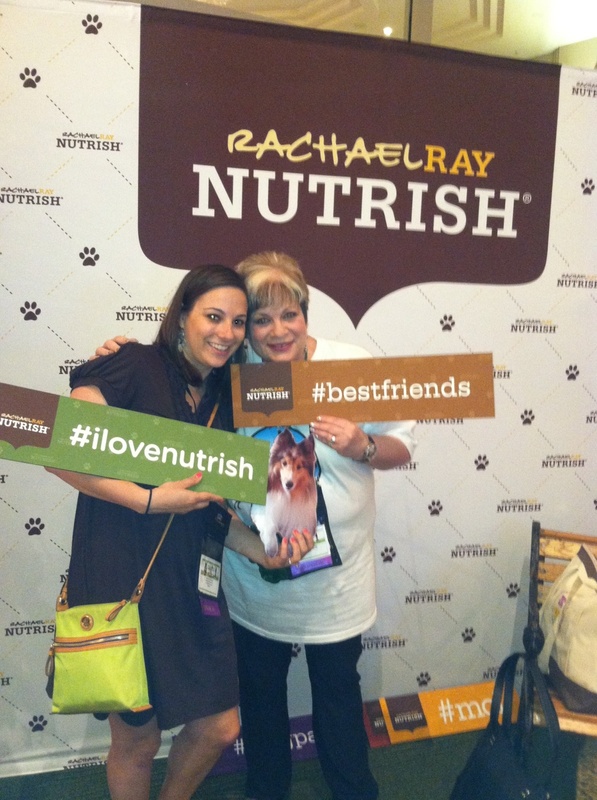 Meeting the Nutrish®team at BlogPaws was a true delight! They are just as warm and personable as the wonderful woman behind the brand that we are representing. Having dinner with them and my fellow blogging friends who were also sponsored, the night before the official kickoff of BlogPaws, was a treat whose flavor will stay in my mouth forever! 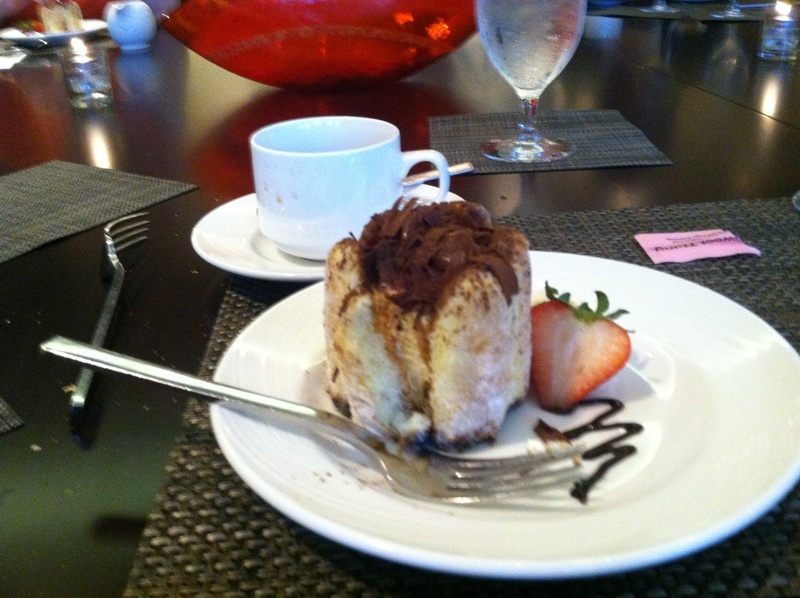 Especially due to the delicious Tiramisu we had for dessert! Without Nutrish® I wouldn’t have met and connected with other bloggers who were sponsored by Nutrish®for BlogPaws. 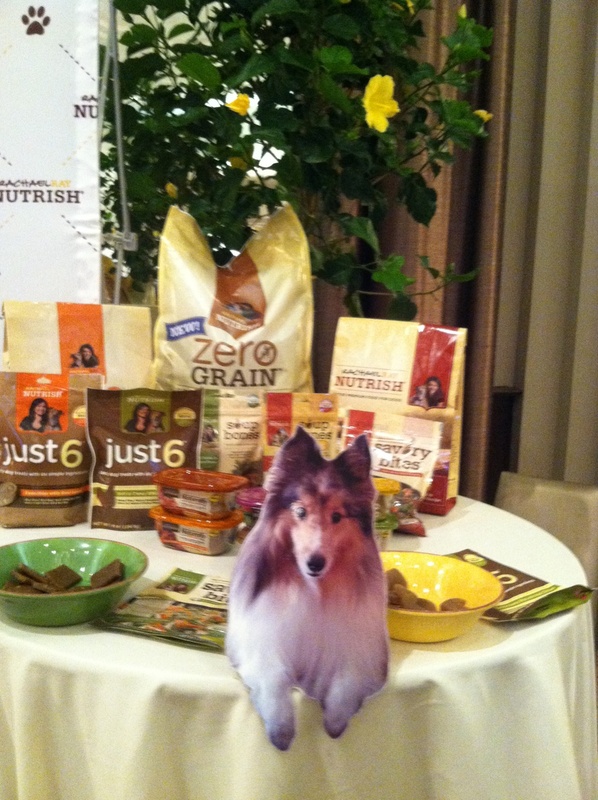 Without Nutrish®I wouldn’t have FINALLY met fellow dog bloggers, Jodi Stone of Heart Like a Dog, Sugar The Golden Retriever’s Mom, Rosalyn, Jen from My Brown Newfies, Carrie from Tales & Tails, Aimee and Chuy from Irresistible Pets, the list goes on and on, and I apologize for not mentioning everyone! 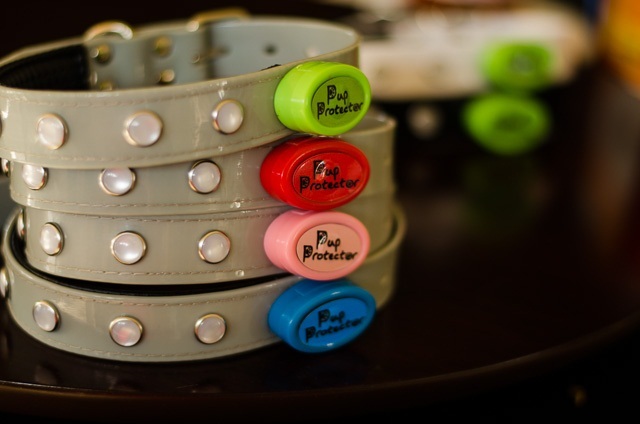 Without Nutrish®I wouldn’t have experienced all that there is to experience at BlogPaws from the Professional Product Review session presented by Rose Hamilton (Pet360). 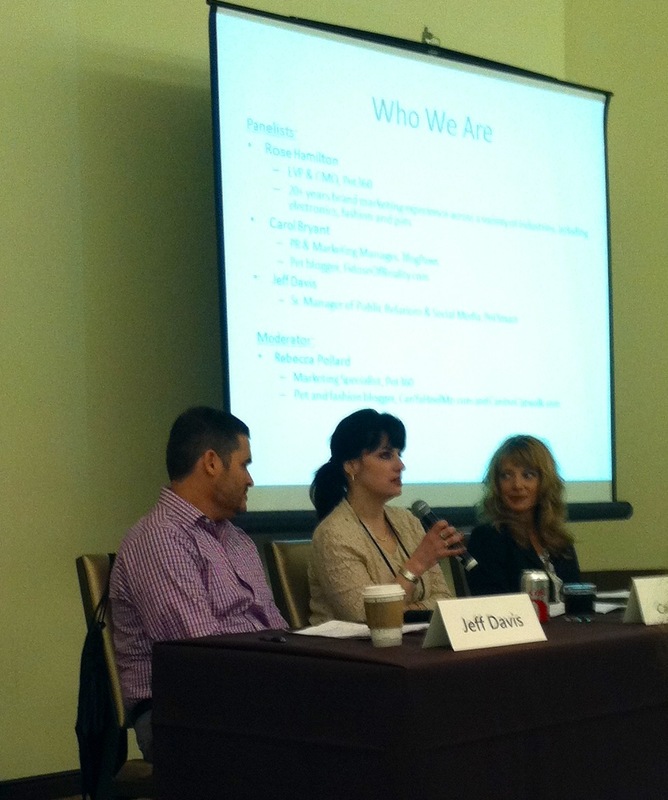 Carol Bryant (of BlogPaws and Pet360) and Jeff Davis. Nor would I have been able to learn from, and enjoy the down-to-earth and wise Kimanzi Constable who presented his workshop, The Key to Marketing with Social Media, which I enjoyed immensely. For those who have stuck around to read this blog-post-turned-into-a-tome, I thank you! If there is a brand that you would love to work with, I am here to tell you it is NOT all about the numbers. It is EVERYTHING about “doing more than is expected” (as I learned in the Professional Product Review session and was thrilled to learn that it was something that I was already doing), and about partnering with a brand that you truly believe in, that you would use NO MATTER WHAT. 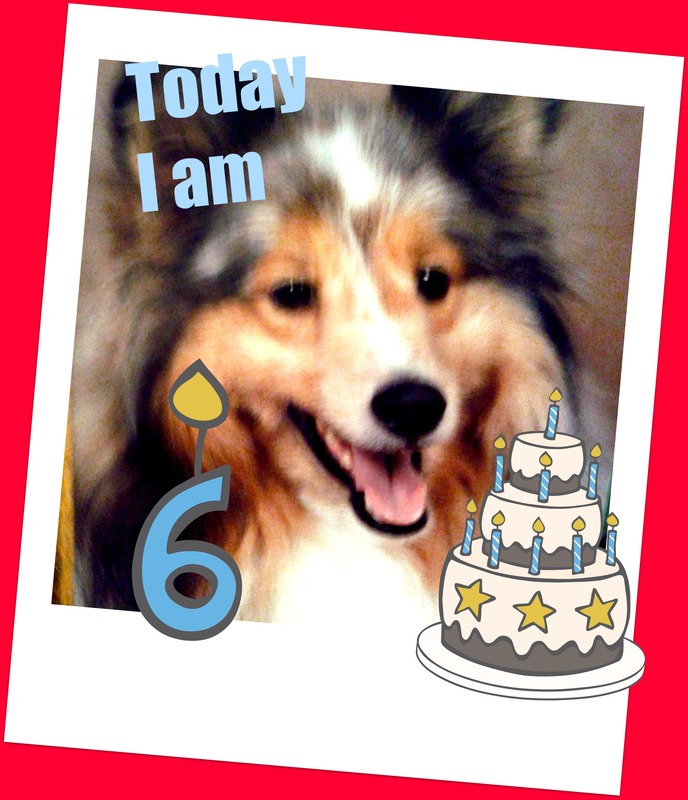 Thank you Nutrish® for your wholesome food, treats, and bones, for making my Sheltie smile, and thank YOU for the honor of representing you at BlogPaws and beyond! YOU ROCK! On the heels of a successful community pet food donation drive that helped fill a truck with food for the Michigan Humane Society’s (MHS) free pet food bank, another gift has arrived just in time for the New Year, and it means a holiday full of hope for hundreds of local animals. More than 8 pallets of Purina® Dog Chow® brand dog food was delivered to MHS this week. This gift of hundreds of pounds of dog food will be used to support MHS’ free pet food bank program, which every year helps thousands of pet owners who love their pets but have fallen on hard times and are struggling to feed them. MHS’ pet food bank assists qualifying low-income families in metro Detroit by providing them with dog or cat food at no charge. 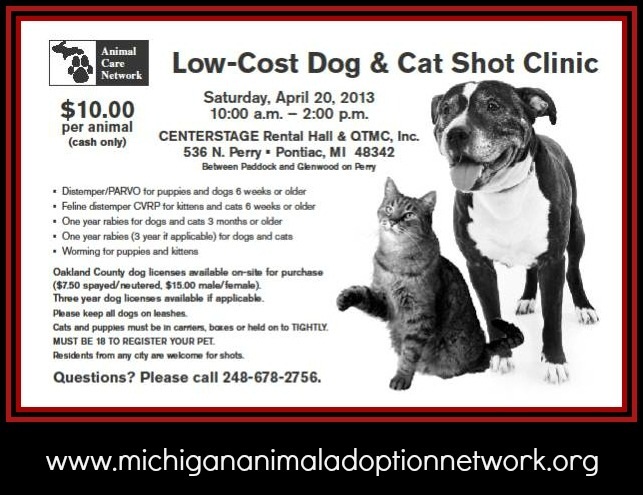 The program is supplied through food donations at MHS’ three centers for animal care, in Detroit, Rochester Hills and Westland. Low-income pet owners can pick up one bag of food every week to help feed their hungry pets. Last Wednesday, MHS was proud to team up with the Detroit Red Wings, including former player Kirk Maltby and the voice of the Red Wings, Ken Kal, at the MHS Detroit Center for Animal Care to help “Fill the Truck” with pet food. Through the community’s tremendous support, more than 100 bags of pet food were collected, and are already being distributed to struggling pet owners. For more information about the MHS free pet food bank, including eligibility information, please visit www.michiganhumane.org, or call 1-866-MHUMANE (648-6263), Monday through Friday, 8 a.m. to 5 p.m. There are many traditions that take place during the holiday season. Some involve music, some involve decorating or the preparing of special heirloom recipes, still others involve the tradition of gifts. When we think of gifts, we think of presents that are in boxes or bags and decorated with silvery, satiny bows. 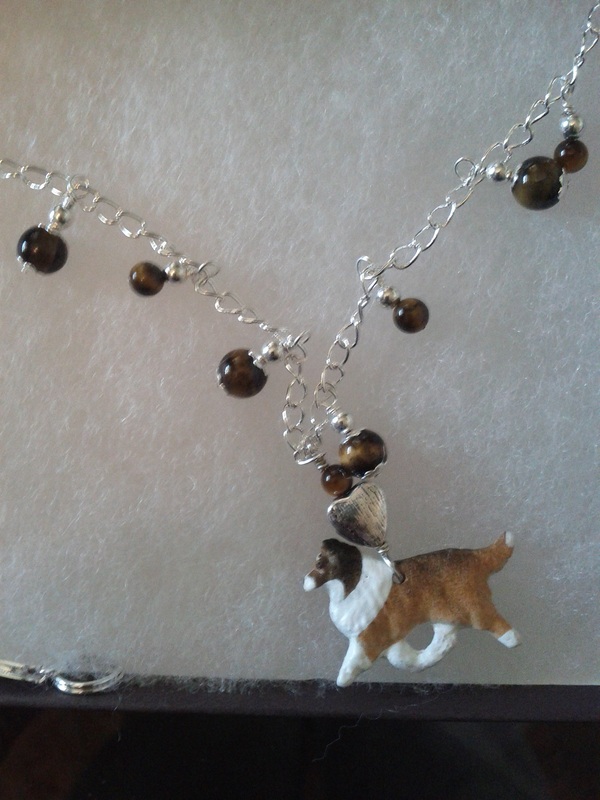 There is what I hope will be a NEW holiday tradition taking place in Blog Land called the Pet Blogger Gift Exchange. Upon first glance one would think that it also involves exchanging gifts with fellow pet bloggers that involve boxes and bows. Not so. What it involves: Positive Affirmations. From Something Wagging This Way Comes: Anytime during the month of December, shower your fellow online animal lover with encouragement and compliments. You can write it into a blog post, tweet about them, set up a Pinterest board, or post to your Facebook wall. 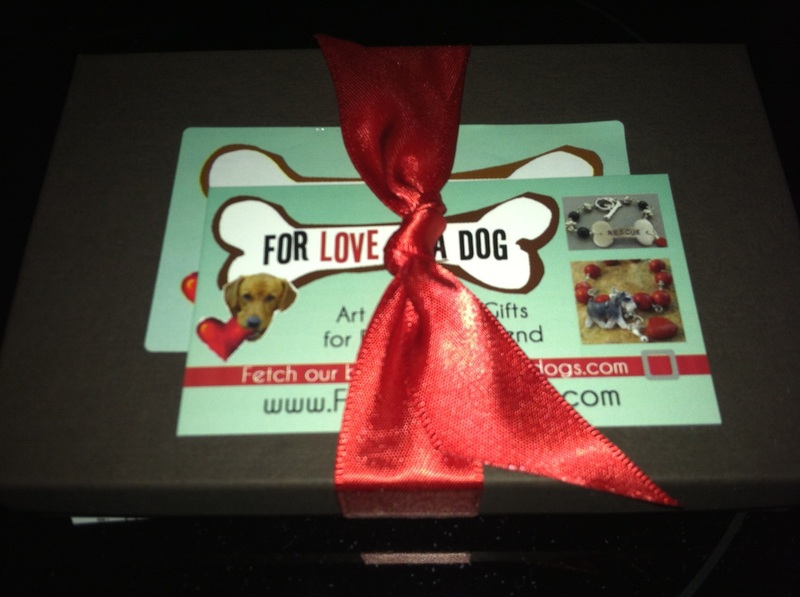 It’s an easy way to share a gift while feeling good yourself for encouraging someone who works so hard at advocating, educating, or just plain entertaining the animal loving community. 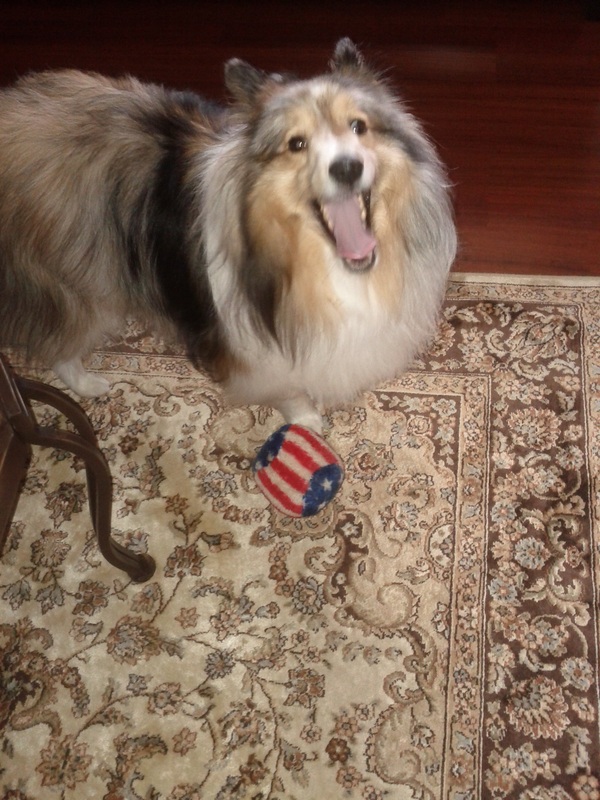 Click the photo to visit Kirby’s blog! 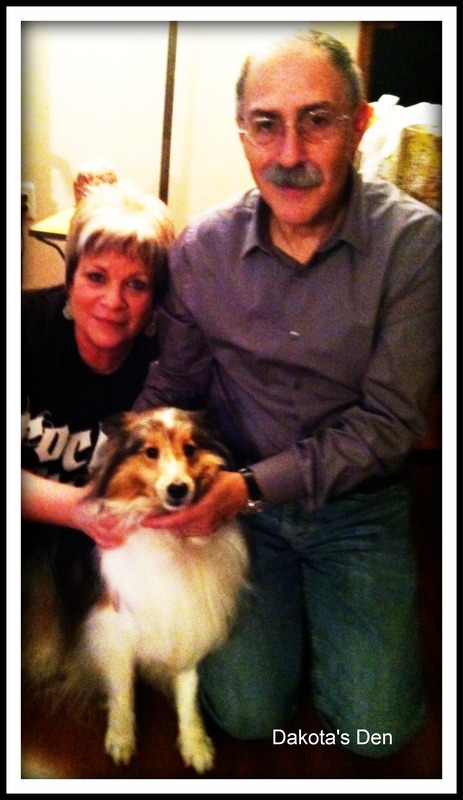 From Kirby’s Dawg Blog September 2012– This blog is going to focus all around the trials and joys of owning my 5 and a 1/2 month old puppy…soon to be dog Kirby! He is quite possibly the happiest adventurous little dog I’ve owned. 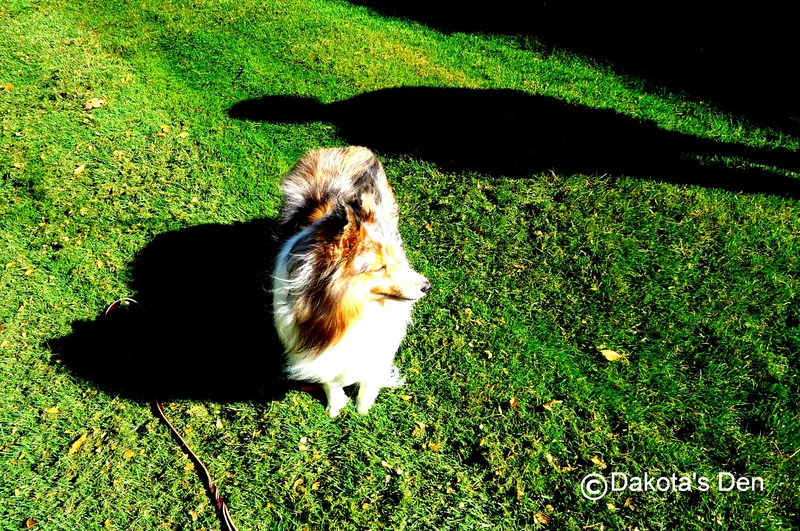 I hope this blog turns into a fun community for dog lover’s alike to discuss and relate to one another. I guarantee there will not be one dull moment with Kirby around- being cute also helps:) I have education in the dog/animal world and am hopeful to put it to some use! What is pitiful is I forgot to find out her name! I am beyond embarrassed! I can tell you the name of every dog and cat in the blogging community (no, not really but I do know A LOT of them) but I forgot to ask Kirby’s Mom her REAL NAME! 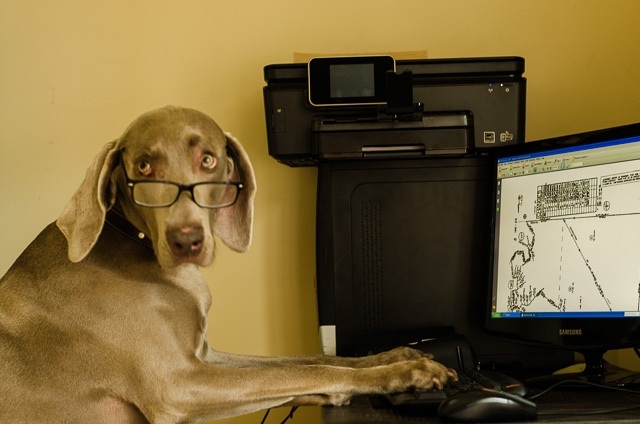 What I see when I visit Kirby’s Dawg Blog is a completely adorable dog who shares his life with a human whose love is evident with each blog post. 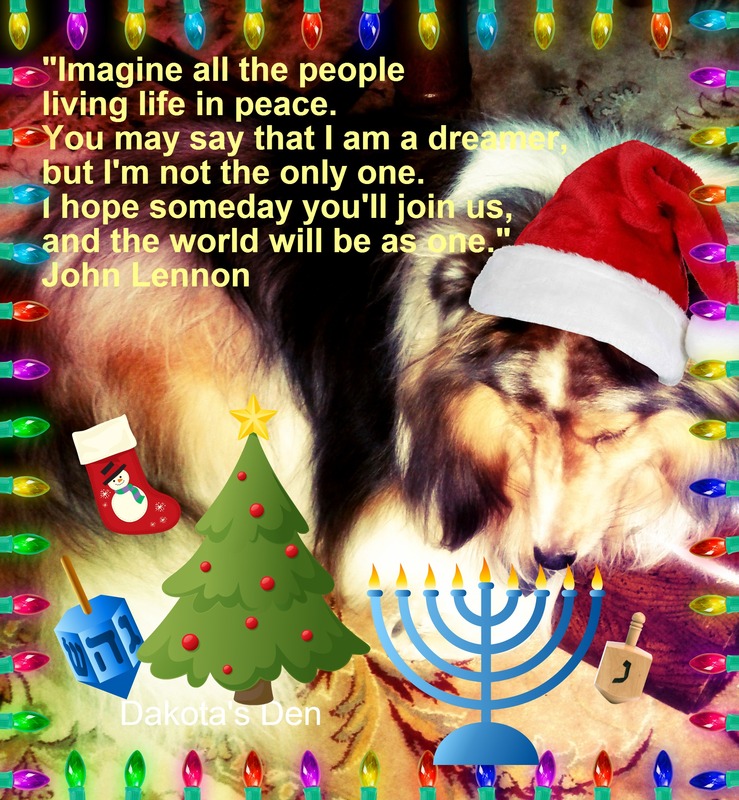 Kirby’s human shares every day events in her dog’s life such as playing, bath time, one of my new favorites, “The Dreaded Christmas Sweater” in a warm, friendly, humorous and welcoming way. 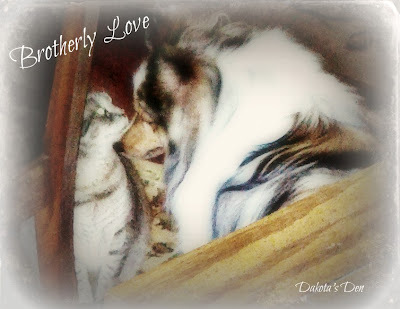 You cannot leave her blog without feelin’ the love and to me that’s what pet blogging is all about. What I am most happy about after having been paired with Kirby’s Mom is that our journey is just beginning, it won’t end after this blog post. I will learn more about this fun-loving, warm and compassionate blogger and guess what? I WILL FINALLY FIND OUT HER NAME!! Hey Kirby’s Human! I am now your #1 Fan and if there is ANYTHING that you need, I am here for you!! ! I’m HONORED to meet you and I am so happy to have you as my new friend! Keep on creating blog posts that are as adorable as the ones you have created, your posts brought a huge smile to my face and warmed my heart. I look forward to reading more! I wish you the warmest of holidays, and give that little guy a HUGE KISS FROM ME!